Figure A36. Halmahera anomaly, interpreted as the Halmahera slab, with (horizontal) [vertical] cross sections through (A)[D] the UUP07 p-wave) and (B)[D] the combined SL2013 and S40RTS s-wave models at 410 km; C) the location of the modern geological record that we interpret to have formed during the subduction of the slab. 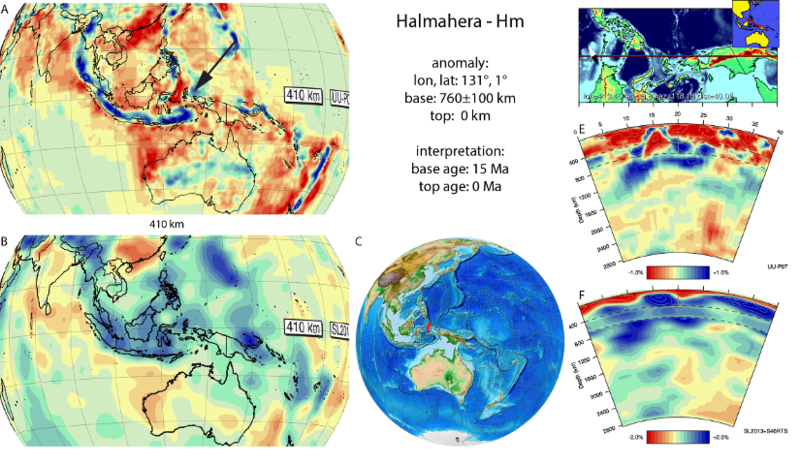 The Halmahera anomaly (Figure A36) corresponds to the A4 anomaly of Hall and Spakman (2002; 2004) and was previously imaged by Widiyantoro and van der Hilst (1997), Hall and Spakman (2015), and Wu et al. (2016). It is interpreted as one of the two actively subducting slabs attached to the Molucca Sea basin lithosphere, the other being the Sangihe slab. It is subducting eastwards below the island of Halmahera and reaches the base of the upper mantle. Wu et al. (2016) separated this slab into three slabs; Molucca Sea East slab in the upper mantle and East Asian Sea west and Ayu Trough Deep in the upper-lower mantle transition zone. In our tomographic model we cannot confidently separate these slabs. Subduction below Halmahera started at 15 Ma in both reconstructions of Hall (2002) and Wu et al. (2016), which we adopt as age for the base of the slab.